Peru’s Qori Kalis glacier has continued its steady retreat back to the Quelccaya Ice Cap, which is also retreating. Glaciologist Lonnie Thompson suggests that Qori Kalis may be gone in five years. Photograph is by Lonnie Thompson, Ohio State University. High atop the Andes in Peru sits the Qori Kalis glacier, part of the larger Quelccaya Ice Cap — the largest body of ice in the tropics. Qori Kalis is one of the few remaining tropical glaciers, and it may be gone in five years, reported Lonnie Thompson, a glaciologist at Ohio State University, at the annual meeting of theAmerican Association for the Advancement of Science in San Francisco in February. Thompson called the recent observations of the rapid melting of Qori Kalis perhaps the clearest evidence yet of global climate change, adding that the current rate of ice retreat exceeds any other in at least the last 5,000 years, as evidenced by ancient plants melting out of the ice. These plants have been buried in the ice for at least 5,000 years, according to radiocarbon dating. 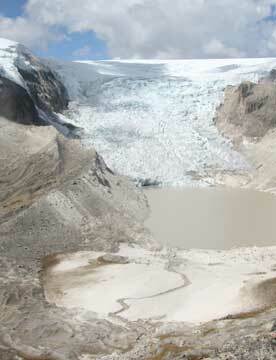 The melting of the Quelccaya Ice Cap poses new hazards to the people living in valleys below the peak, Thompson said. Rapid melting means that although the people will have more drinking water in the short term, this source will soon run out. Additionally, meltwater is creating a deep lake in the valley that is currently contained by a natural dam, which could overflow or break outright with the increased water pressure.